Mid-March in Orono can mean only one thing…the Hockey East tournament. Sure, we love what Coach Richard Barron has done with the women’s basketball team. Yes, we’d give anything to see our men’s hoops program legitimized and finally qualify for the NCAA tournament. But, at the end of the day, the success of the University of Maine winter sports season comes down to just one thing…the success of the men’s ice hockey team. Just four weeks ago, the Black Bears held their postseason fate in their own hands. They sat in 3rd place in the Hockey East standings and were a relatively comfortable 12th in the national USCHO PairWise rankings, a barometer for who the top 16 teams would be to earn qualification for the NCAA tournament. Maine was also playing some of its best hockey of the season, having just swept Merrimack in a weekend series at the Alfond. Since then, our heroes lost control of their destiny by losing three of their final four regular season games (and only managing a tie in the other). That regular season skid culminated (or, more accurately, bottomed out) with two weekend losses at the hands of the Providence Friars. From that result, it was Providence who moved into the #3 seed in the Hockey East tournament and it was Maine who suddenly found themselves falling to #22 in PairWise and needing to survive a win-or-go-home game against Merrimack last weekend to advance to the quarterfinals of the conference tournament. As Fill The Steins Nation knows by now, Maine did, indeed, survive. As their reward for survival, they have the opportunity to exact revenge on the aforementioned Friars and advance to the semifinals of the Hockey East tournament at the TD Garden. The task ahead, though, is not small. 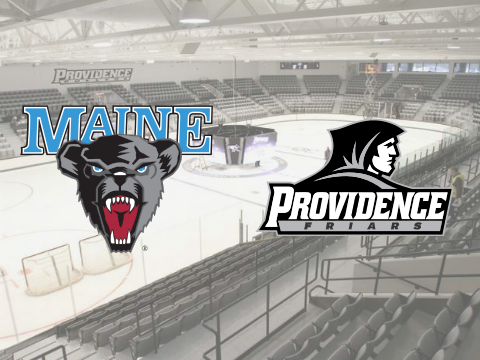 Maine must not only beat Providence once this weekend, they must beat the Friars in a best two-out-of-three series in Providence. This seems especially problematic for the Black Bears, who are a borderline embarrassing 1-10-3 in true road games this season. By contrast, Providence is a solid 10-5-2 at Schneider Arena throughout the 2013-14 campaign and must be considered the favorites headed into this weekend’s series. Make no mistake, though, Maine has weapons. We all know what the likes of Devin Shore, Ryan Lomberg and, most importantly, goaltender Martin Ouellette can do for the Black Bears. We also know that Coach Red Gendron has re-instilled a renewed expectation of pride, accountability, and passion both in the locker room and on the ice, an expectation that was missing in the latter seasons of Tim Whitehead’s tenure. Perhaps Maine’s greatest asset this season, however, has been Ouellette. A good goalie in hockey is like a good closer in baseball or a good kicker in football. He can be a game changer, and Ouellette usually is. Against Providence, though, Ouellette is literally negated. Providence’s Jon Gillies (yes, THAT Jon Gillies, from South Portland) has the exact same 2.22 GAA and the exact same .927 save % as Ouellette. Even if you give Maine’s first line (and overall talent depth, if you want to be somewhat generous) the advantage over Providence, it’s an advantage that is ever-so-slight, and one that is more than offset by Maine’s terrible results away from the Alfond. As WMEB’s Cody Beckett correctly told us on last week’s Fill The Steins Podcast, Maine will likely need a weekend sweep of Providence and at least one win at the Garden to even possibly put themselves on the right side of the NCAA bubble. As much as we want to believe that’s all going to happen, Fill The Steins sees Maine losing Friday, winning with their backs against the wall on Saturday, and ultimately falling 4-1 in Sunday’s decider against Providence. Yes, these results will leave Maine on the outside looking in come NCAA tournament time. But the foundation for success has been built. Coach Gendron has this team and the program as a whole moving in the right direction. Maine will be back sooner than later. Is Fill The Steins underestimating our heroes this weekend? Do you think the Providence series will turn out differently? Give us your predictions in the comments section below and join the conversation on Twitter using #FTSTourneyTime!! !